Michael Franti first made a name for himself in the music business in the late 1980's with his alternative punk band The Beatnigs. The name of the band alone drew attention from critics and the group developed a following. 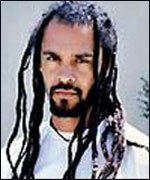 In 1992, Michael Franti and Rono Tse formed the ultra-political hip-hop group The Disposable Heroes of Hiphoprisy. The pair released only one album (Hypocrisy is the Greatest Luxury on 4th &amp; Bway/Island) and split paths. Franti, however, continued to make moves in the music world. 1994 brought Home, the critically acclaimed album from Franti's new group, Spearhead. The album contained socially relevant tracks like the award-winning "Positive" (which stressed getting tested for HIV) yet showed a musical growth for Franti. The music was rich, with live musicians providing wonderful backup. And Franti's vocals were no longer being delivered in the abstract, conversational manner of his Disposable Heroes days, but rather with smooth, laid back raps and singjay reggae stylings. This summer saw a couple of personnel changes in Spearhead as well as a new album, Chocolate Supa Highway on Capitol Records. The new release was even more musically complex than Home, yet maintained a very socio-political feel to it. I still be memorizing lines out on the basketball court. But the whitey was the bomber. I think you spent your whole life watchin' cable in seclusion. Among the most notable of tracks on the new release is the first single, "Rebel Music (3 O'Clock Roadblock)," a remake of the Bob Marley classic, sung by his son Steven Marley. The resemblance between father and son is nothing short of striking. It sent a chill up Franti's spine as well. "Steven is a powerful man. He captures the spirit of his father. He's a very tough guy, but he's also a very spiritual person, and guided by the spirit of his father," Franti commented. "To me, the similarity in the voice comes through the similarity in their spirits." Franti's reggae influences include artists Bob Marley and Macka B and dub poets Linton Kwesi Johnson and Mutabaruka. He has also worked with world music artist Zap Mama and put in time on Steel Pulse's latest release on Mesa/Bluemoon, Rage &amp; Fury (the track is titled "Black Enough?"). "They're heroes of mine," Franti said. "Records like True Democracy are a big part of my background in terms of listening to music." Franti also has a project coming out in the near future with Mutabaruka and has done several live spoken word appearances, inspired by Linton Kwesi Johnson. "Having seen LKJ get up on stage with his band and stop to let the words be heard by themself," Franti said. "I first found the impulse to do some spoken word events because people wanted to hear the words without the music." Besides the musical connection to reggae music, Franti also feels a very close spiritual tie. Spending lots of time with the Rastas in his touring camp, Franti learned how to put his faith to work for relaxation and enlightenment. "There's days when my energy gets so run down, not just the body's tired, but my spirit is drained 'cause I'm putting out so much," Franti said. "Through breathing, meditation, and prayer I'm able to close my eyes and have that light enter my spirit." With a spiritual, political, and social approach like Bob Marley, Marvin Gaye, and Curtis Mayfield, it's no wonder that the funk-filled reggae hip-hop stylee of Spearhead is such tasty soul food. In a world of pain and despair masked by the rich and powerful few, Spearhead offers a powerful intellectual look into the social problems while also making music that fills the spirit with positive vibes every time. Originally appeared in Reggae Report.